The Royal Blue Hotel, which is 700 feet above sea level, offers breathtaking panoramic views of Paphos and the surrounding coastline. In addition to the beautiful scenery, on-site facilities include a bar, shop, four outdoor swimming pools, tennis courts, a gym and an indoor heated swimming pool. Royal Blue’s on-site restaurant also serves delicious Cypriot cuisine and offers room service so guests can enjoy breakfast in the comfort of their room. The spacious suites offer beautiful sea views with the resort’s studio style, one- and two-bedroom units.Two dedroom units are suitable for 4 adults and 2 kids, not 6 adults. Accommodations also include free Wi-Fi, air conditioning, towels, a flat screen television, cable, a DVD player, hairdryer and more. On leaving Paphos International Airport follow the exit road until you come to a T-junction, this is the main Paphos – Limassol B6 road. Turn left and proceed along this road for approximately 8 kilometres. This will bring you to a village called Geroskipou. Continue through Geroskipou until you see the AGIP petrol station located on the right hand side of the road. At the traffic lights after the petrol station turn right and follow the road to the end. Turn right then take the first turning on the left and follow the road up to the Resort. The resort is within easy reach of the beach, town center and a water park, around 5KM. 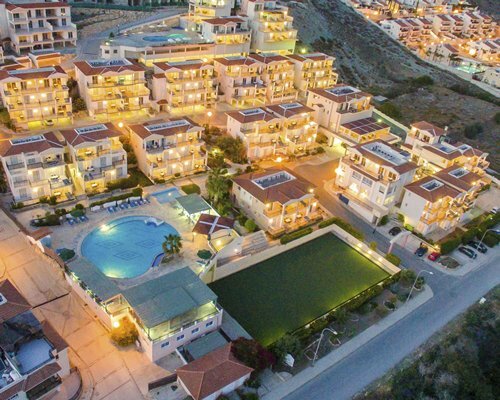 The Markideio Theatre, which hosts a variety of events and shows, Kennedy Square, Metropolis of Paphos and Elea Golf Estate are also nearby for guests to visit.